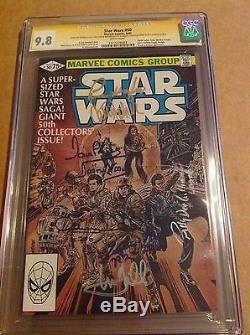 CGC 9.8 Signature Series Star Wars #50. Signed by the stars of the original Star Wars Trilogy. Billy Dee Williams- Lando Calrissean. Walt Simonson & Tom Palmer cover & art. Darth Vader, Yoda, Obi-Wan Kenobi, Klysk, Domina Tagge, Dengar, Bossk & Zuckuss appearance. The item "CGC SS 9.8 Star Wars #50 signed Hamill Fisher Daniels Baker Prowse Mayhew + one" is in sale since Tuesday, August 30, 2016. This item is in the category "Collectibles\Comics\Bronze Age (1970-83)\Superhero\Star Wars". The seller is "piersonite2012" and is located in Bradenton, Florida.